These are 4 luxury lodges along the Salkantay Route to Machu Picchu used in our Luxury Lodge Trek. Enjoy the breathtaking scenery without sacrificing creature comforts. The lodges offer warmth and comfort after the day's exertions in beautiful, remote locations. The lodges have been designed and built in accordance with traditional building techniques and local architecture and with respect for the environment. Each lodge has an outdoor jacuzzi, ideal for soothing tired limbs after the day's trekking. Meals, based on delicious local cuisine, including the innovative 'Andean Energetic Cuisine', created by the MLP's food and beverage director, and drinks are served to fit in with the trekking itinerary. 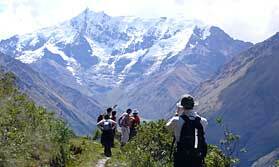 All enjoy wonderful settings in the Cordillera Vicabamba, the Andean mountain range which includes Machu Picchu. All are well away from the camp sites of the Inca Trail, so guests can relish the spectacular scenery in peace and tranquility. Mountain Lodges of Peru has a strong track record in sustainable tourism and works closely with local communities to help them benefit from tourism. Location: The lodges are located at strategic points along the route. Salcantay is at Soraypampa and the others at Huayraccmachay, Colpapampa and Lucmabamba, where guests spend one night each. Lucma Lodge is close to coffee plantations - and guests are served the excellent local coffee. Rooms: Salkantay Lodge has 12 rooms, all with ensuite shower rooms, while each of the other 3 lodges - Wayra, Colpa and Lucma - has 6 ensuite rooms. All lodges provide ample hot water, with shower gel, shampoo and conditioner provided. The lodges are heated to a comfortable 23 degrees centigrade, and the beds feature goose down duvets. The lodges are at the following alitutudes: Salktantay 3,869m, Wayra 3,906m, Colpa 2,870m and Lucma 2,135m. Activities: Trekking, village visits and cultural excursions, with fishing, horse riding and mountain biking available at some lodges. Health: This region is not a malarial area. "All totally excellent with lovely simple rooms and great views from the lodges. The staff were so welcoming after a long days hike, food excellent and even the hiking boots were cleaned while we slept." "Simply amazing - so good that we wanted to do it all over again. The accommodation was perfectly suited to the needs of tired trekkers, and our traveling chefs conjured up wonders at every mealtime, wherever we were." "These are just fantastic, very high quality accommodation and very good food. Again an amazing experience with breathtaking scenery, beautiful lodges and great food."